It's pretty cool when Rachel Maddow tweets about you. 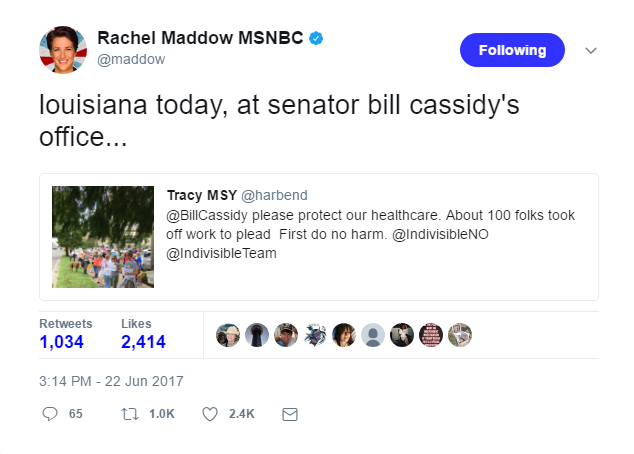 For her 8 million followers on Twitter, Maddow highlighted Indivisible NOLA's and Metairie Indivisible's protest in front of Senator Cassidy's Metairie office on Thursday, June 22. She knows we're doing the important work of democracy. "The group said it wanted to give residents a chance to engage with the candidates with questions about racial equality, education, criminal justice reform and affordable housing." Local daily The Advocate tells its readers all about the packed town hall organized by Indivisible New Orleans. We invited candidates running for mayor of New Orleans to talk with us. WWL-TV came too. Indivisible New Orleans' Joyce Vansean and Metairie Indivisible's Lara Crigger talk with Vox about the uphill battle to fight Trumpcare in the face of Republican secrecy. Indivisible Nola holds forum of mayoral candidates for our members but gains attention citywide. Indivisible NOLA and friends gathered at a notorious pothole to protest the deplorable state of our city's streets. Indivisible NOLA's own Joyce Vansean discussed the removal of confederate monuments on The Offer, a radio show WHIV 102.3 FM. Broadcast on Memorial Day 2017. Listen to the full show on The Offer's Facebook page.